Why Walk the Digital Portfolio Talk with Your Students? Professional Portfolios Promote the Coherence of Your Teaching Philosophy. Reflective Pedagogy is Powerful for Students and Faculty. You Can Express Your Unique Teaching Style & Creativity. Done Properly, Professional Portfolios Engage Teachers in Their Teaching & Learning. You Can Properly Look Back on Your Teaching & Learning in One Space. This means you can also evaluate it. Provides Evidence of Meeting Professional & Community Standards. Creating an Engaging Teaching Website Reinforces Lessons of Digital Rhetoric and Computer Literacy that You Can Share with Students. Professional & Learning Portfolios Help Advance a Culture of Evidence at SLCC. Professional Portfolios Demonstrate Instructor Intentionality with Respect to Teaching Strategies, Theoretical Approaches, and More. 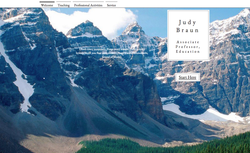 Examples of faculty professional portfolios created using Digication coming soon! For more specific information and guidelines on developing a professional portfolio for rank and tenure, we encourage you to review the Professional Portfolio materials created by Tiffany Rousculp (Director, Writing Across the College) before you begin building your Professional Portfolio. These materials will walk you through how to craft a teaching philosophy, gathering and using evidence, and much more. ​Click HERE to access WAC@SLCC professional portfolio materials. The professional portfolios below have implemented the most recent guidelines for rank and tenure advancement at SLCC. Click on the images below to access and experience professional ePortfolios created by faculty and staff from across disciplines. For non-rank and tenure examples, please click HERE.